The map of the world shows that families from all around the globe will come to Ireland for what will be a truly international event. While we see only a glimpse of the continents, they represent the whole world: the common home of all families, entrusted to us by God. In his encyclical letter,Opens in new window Laudato Si, Pope Francis reminds us that families have a vital role to play in caring for our common home. He reminds us that Saint Francis of Assisi described our earth itself as “like a sister with whom we share our life and a beautiful mother who opens her arms to embrace us”. (Opens in new windowCf. Pope Francis, Laudato Si: On Care for our Common Home, n.1). 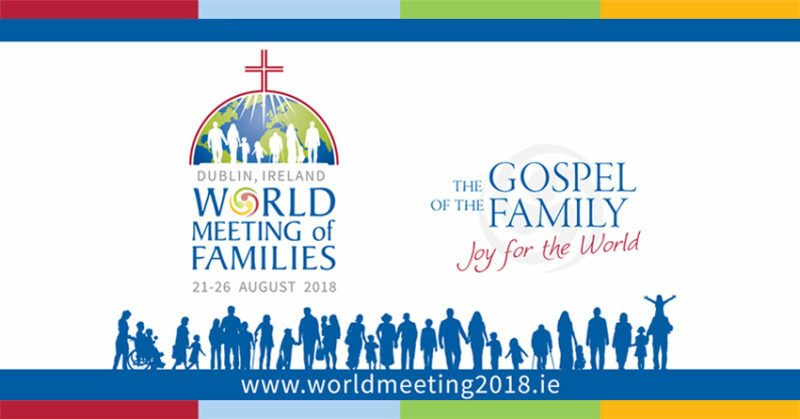 The World Meeting of Families in Dublin, Ireland, will explore how families, as our first home, can help us to care for our common home. The red semicircle with the cross on the top echoes the logo of the Archdiocese of Dublin, which is the host diocese for WMOF2018. As well as representing God’s love, flowing from the cross, embracing all the families of the world, the semicircle and cross also represent the ‘dome’ of the Church, “a family of families, constantly enriched by the lives of all those domestic churches” (Opens in new windowPope Francis, The Joy of Love, n. 87). In the logo, as in real life, the Church embraces the family, protects the family and supports the family. When our families are stronger, society is stronger, and the Church is stronger.